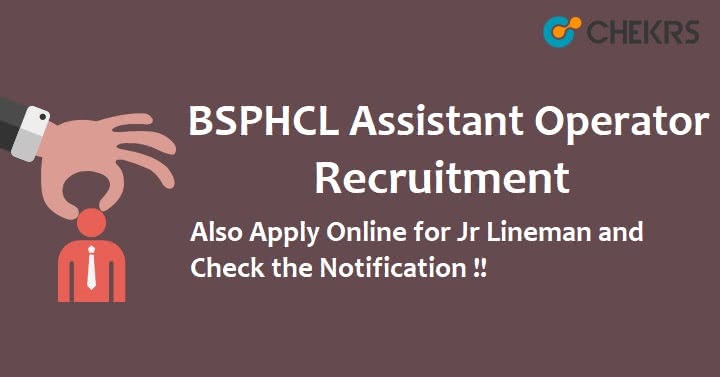 BSPHCL Assistant Operator Recruitment 2018: Bihar State Power Holding Company Limited has brought a good news for all the job seekers in the form of new job vacancies for the posts of Assistant Operator, Jr Line man, Technician and Switch Board Operator. Candidates, who are interested in these Government Jobs can apply before 8-10-2018 on the official website. For more related details, refer to the BSPHCL Vacancy 2018 Notification. Follow the given instructions if you have intention to apply for the Bihar State Power Holding Company Vacancy but before that you need to check your eligibility for the post. Check the homepage and go to the upper right corner. Click on the link for BSPHCL Switch Board Operator Online Form 2018. Move ahead and complete the one time registration. Login yourself with the help of registration details. Pay the application fee via online payment mode. Upload the digital photograph and signature. Verify the details before submitting the form. Remarks: For more detailed information regarding BSPHCL Assistant Operator Recruitment 2018, refer to the official notification. Also leave your queries in the comment box.